Home Cover Story Wall of Forgotten Natives to move indoors? Officials from Minneapolis, Hennepin County, Red Lake Nation and other planners have set Dec. 8 as the date for the homeless encampment near Hiawatha and Franklin Avenues to relocate indoors at a “navigation center” to help the homeless brave the cold and seek other housing. Whether that can be achieved by the target date was “iffy” at the end of November. The head of the Metropolitan Urban Indian Directors (MUID) umbrella organization told Native American groups at month’s end that the move would more likely be after Dec. 15. 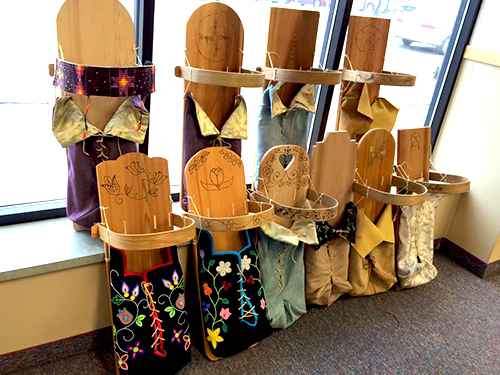 “I’ve heard some people say closer to Jan. 1,” said Patina Park, MUID chair and the executive director of the affiliated Minnesota Indian Women’s Resource Center. The homeless encampment, predominantly made up of Native Americans, has been called the Wall of Forgotten Natives. 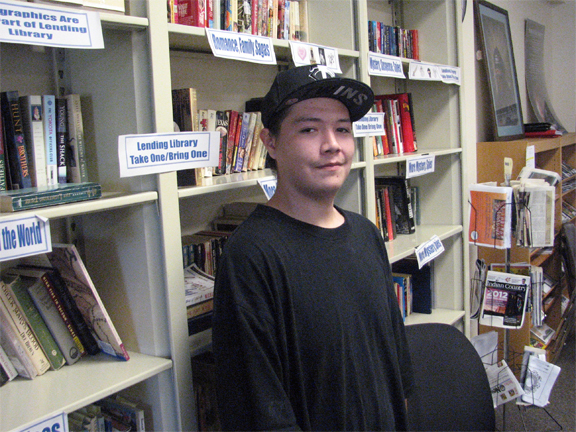 The new site is now being referred to as the Red Lake Navigation Center. The new site is nearby on property owned by Red Lake Nation. It will be temporary shelter during the winter months since Red Lake intends to demolish the property and develop a large-scale, mixed-use development with 109 units of affordable housing on the site. MUID affiliated Native organizations and other governmental and nonprofit groups had made late-fall progress in finding homes for some homeless residents of the camp as cold weather returned. But even as these groups and others made progress in finding housing for some members, new campers arrived. St. Paul and state officials closed a similar encampment at the Cathedral Hill area of St. Paul in mid-November. There was no pre-arranged alternative shelter site. An unknown number of St. Paul’s homeless moved their scant belongings across the river to the Minneapolis encampment. Current plans for the Red Lake Navigation Center would house 120 people. Some residents of the camp told Twin Cities media they wouldn’t move indoors if they felt it was more like a concentration camp than a housing alternative. As many as 300 people were believed to live in the encampment in late summer. A survey in October by Red Lake and Indian groups found 191 individuals and 103 tents at the site. But those numbers are known to have grown or shrunk in the weeks since. • A constant concern among Indian leaders and public officials about safety in the encampment became reality on Nov. 19 when a fire ignited a tent and razed about 10 tents before Minneapolis Fire Department crews put it out. One person was hospitalized for smoke inhalation. • Several more cases of drug overdoses were reported and handled by health crews provided by MUID-affiliated Indian groups and public health agencies. • The Metropolitan Council approved $2.5 million in grants for groups and developers to help build 250 affordable houses and apartments. Included in the grants was $344,700 for Mino Bimaadiziwin, the development Red Lake is planning for the property where the navigation center is setting up shop. “That’s important for the long-term fix,” Park said. But it means homelessness and neighborhood problems will also likely return in the spring unless something significant occurs for finding housing for people during their navigation center stay. During the month, the Native groups learned that public officials hired the Simpson Housing Services nonprofit housing group to manage the navigation center. Metro Native groups are engaged with providing services at the existing encampment but were not part of the planning for the navigation center. Recently, Park said, Simpson has reached out to MUID officials to see where the Native groups can provide continuing services at the center if and when the existing encampment is actually closed. The Simpson executive director, Steven Horsfield, has hired Marian Wright (Ojibwe) to manage the site. MUID agencies and groups have been doing the day-to-day at the encampment since it grew to size in August. The organization includes 36 voting Native member groups and 17 non-voting organizations that interact with the members. 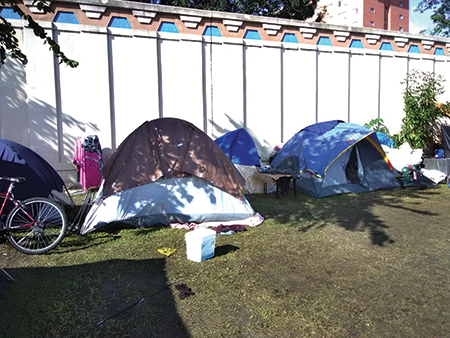 In a summary of encampment activities the MUID groups have performed, Park noted groups or members supplied a variety of materials including a large Hygiene Services (HAS) Tent and outreach workers and staff for it. These staffers provided expertise in housing, child protection prevention and support, parenting support, mental health, sexual and domestic violence outreach and chemical dependency assessments. MUID groups also hired four additional staff to work at the encampment. They worked on organizing food donations, water and beverages; organizing community donations to assess immediate needs of the campers and prevent excess materials and trash; store and inventory donated materials; coordinate communications between the camp and city services, and organize volunteers for services such as trash cleanup and laundry. Other MUID provided services varied from medical outreach and treatments and bringing clinical services to the camp, the purchase and distribution of various supplies, and operating the encampment’s website (www.franklinhiawathacamp.org). A list of MUID members and their non-voting partners can be found at https://muidgroup.wixsite.com/muid/member-orgs.